Nepata presents a world first at ICE Europe 2019: A machine that separates self-adhesive film from its carrier paper. This makes it possible to obtain recyclable, pure PVC from faulty film media. The Nepata DL1650 film separator is the first machine to allow for automated delamination of films. It thereby helps avoid plastic waste and expensive disposal. During the manufacture of self-adhesive films, the coating process, waste material is created. Thus far, the disposal of faulty film rolls was a costly expense. The newly developed machine separates a 50-meter roll in around two minutes. Rolls of up to 350 mm in diameter and 1,650 mm in width can be processed. 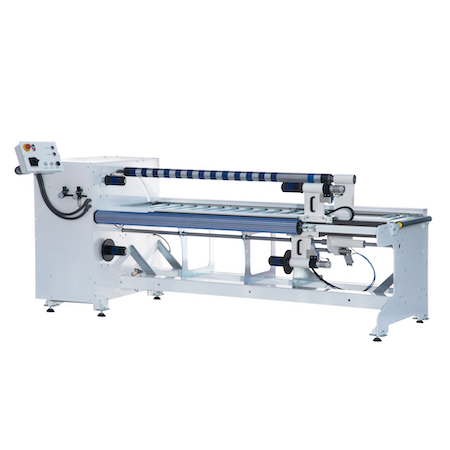 The DL1650 separates the layers and rewinds PVC film and kraft paper individually. At the film side, this process is coreless, whereby pure material is generated. In addition, the designers paid particular attention to ergonomics and operator safety: A single machine operating around the clock can recover several thousands of tons of pure PVC each year. Like all of Nepata’s film processing and converting machines, the DL1650 is 100% made in Germany. With its film separator, Nepata has applied for the ICE Award in the category ‘Sustainable Products and Manufacturing Processes’. In addition to this world first, Nepata will be displaying its proven conversion solutions at ICE Europe 2019. The UA1650 ADWS Conversion Center, the 1900 ADWS slitting machine and the UA770 rewinding and cutting machine will be on display and demonstrated live. All Nepata slitting machines and conversion centers (ADW/ADWS models) are now shipping with two new features that make them even more precise: A jaw lubrication system for the slitting head lightly lubricates the blade with silicone oil. The new line laser provided on the slitting head reliably displays the slitting blade’s exact position on any film or paper surface. Contact Us to find out how we can help with your Film Slitting Blades needs as well as all of your industrial razor blades needs.